Comes with AA batteries but 9V power supply is recommended. None in stock at the moment, ask and we can get you one. Analog Man carries the Boss RT-20 Rotary Sound Processor. From the Beatles to Jeff Beck, Santana to Stevie Ray, many guitar greats have embraced the rotary-speaker sound. Today BOSS proudly announces the RT-20 Rotary Sound Processor. From the Beatles to Jeff Beck, Santana to Stevie Ray, many guitar greats have embraced the rotary-speaker sound on stage and in the studio. Today BOSS proudly announces the newest member of its Twin Pedal series — the RT-20 Rotary Sound Processor. Employing COSM®-modeling technology, the RT-20 authentically reproduces classic rotary-speaker sounds. It offers adjustable Rise Time, Horn and Bass speed, Overdrive, and more. And not just for classic twirl, the RT-20 can be used to create unique overdrive and pulsating effects as well. This pedal sounds amazing, and offers a stunning graphical view of the virtual rotors on its built-in display. When I visited the Bruce Springsteen tour in 2008 I found three of these being used, two on guitars and even one on the Hammond B3! 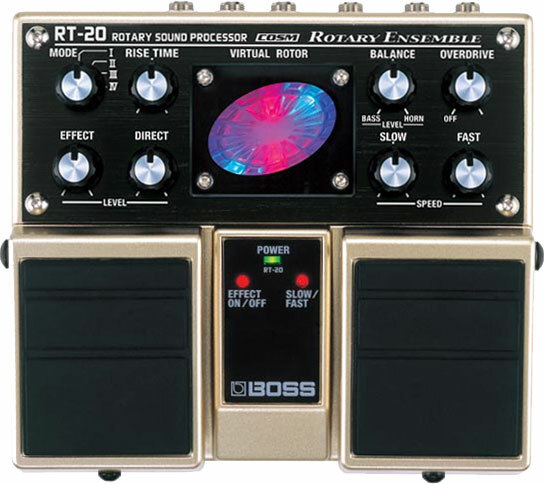 Recently I purchased the Boss RT 20 Rotary Pedal from you. I would like to say I like it very much. I am a keyboard/sax/harmonica player and music educator. I was surprised how well it worked. I have a Leslie 720 and a Leslie 18 so I know how the real rotary sounds is. The Boss RT 20 does the job well...of course not the same as the real deal but it does a great job.